When my husband and I took a little getaway recently, we left without any set plans except to explore. The trip worked out wonderfully; we found ourselves refreshed by easy discoveries of countless charming shops, festive neighborhoods, and beautiful bridges and buildings. One evening, we happened upon a colorful and inviting corner restaurant aptly named El Cubo de Cuba. Its friendly, casual atmosphere offered a warm welcome on a frigid winter night. We happily ordered plantain-laden plates of rich yellow rice, spiced beans, stewed veggies and simmered meats. And we noticed a little sign at the counter: “Heat up with a hot buttered rum!” I ordered one, impulsively. When the drink was served, I found myself nestling a steaming mug with a beautiful orange slice floating at its surface. Its scent was rich with melted butter and a bit of scrumptious spice. My senses were enraptured as I was brought to that magical moment when you know your dessert is almost done baking: the kitchen is toasty and the air is so fragrant you wish you could eat it instead of inhale. I knew right then that a buttered rum dessert was to be my next creation. It would have to be relaxed, warming and delicious — just like the place that inspired it. 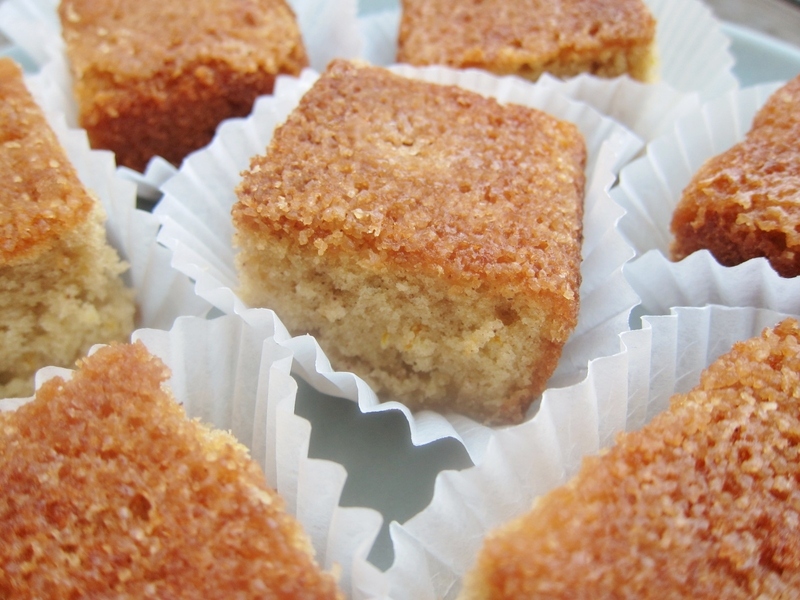 A soft sheet cake proved to be the perfect format: one with a moist crumb and a balance of toothsome textures in every flavorful bite. Place one oven rack on the lowest rung, and one at the center or a little higher. (The partial baking time on the lower rung will help create a crisp sugar layer.) Preheat oven to 325 F. Grease the sides and bottom of a 9 x 13″ pan, then line the bottom with parchment, and grease the top of the parchment. Sprinkle the buttered parchment evenly with the turbinado sugar, being sure to get it all the way to the edges. Set pan aside. In a large bowl, beat the cup of butter and the sugars until pale and fluffy. Keep beating as you add the eggs one at a time. Beat in the vanilla. 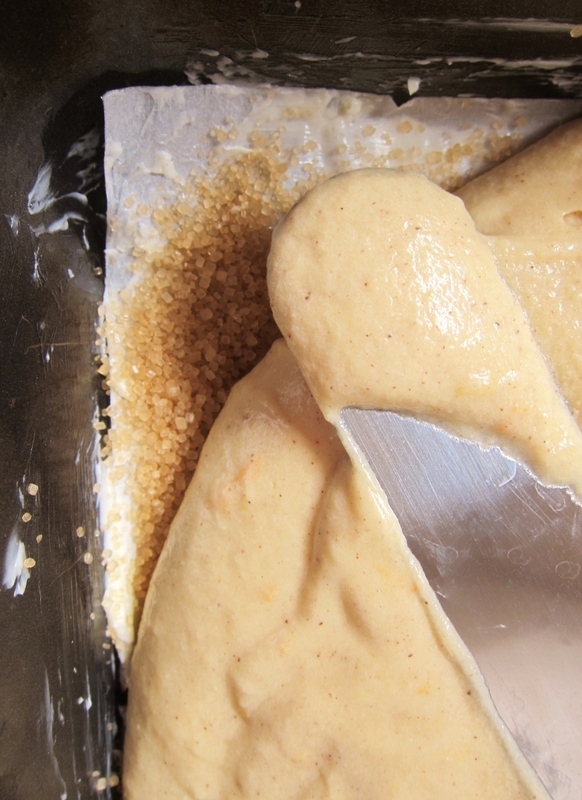 Over the butter mixture, sift: flour, baking powder and soda, salt, and cinnamon. Begin to mix, gradually adding buttermilk and rum as you stir, stopping and scraping down sides of bowl with spatula very often. Just when batter is smooth and even, fold in the zest until evenly distributed. Gently spread batter into sugared pan, without pulling upward (you don’t want to move the turbinado sugar much). Set filled pan on the low rack in oven and bake for 20 minutes, then quickly and carefully move cake to upper rung (at center or a little higher); bake for about 12-15 minutes. 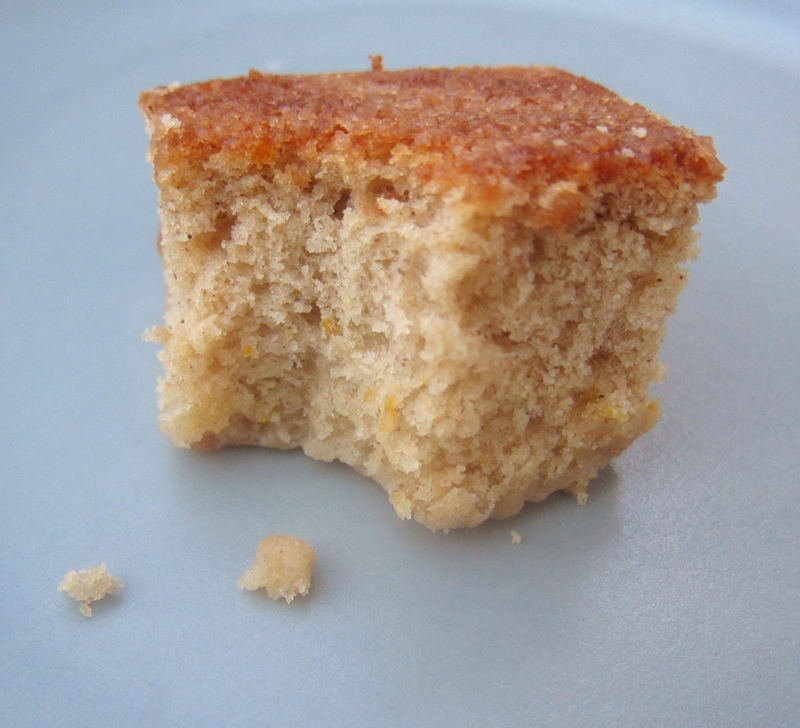 Check cake’s center with a toothpick; when cake is done, toothpick will come out free of wet batter (a few moist crumbs are OK). Cake will be golden, domed and fragrant. Remove from oven; immediately make the buttered rum soak. In a small saucepan, heat all ingredients over low/medium heat, stirring occasionally and heating just until the sugar dissolves and butter is melted. Do not boil or overheat. Use a skewer to poke numerous holes evenly all over the warm cake, being sure to go to edges. 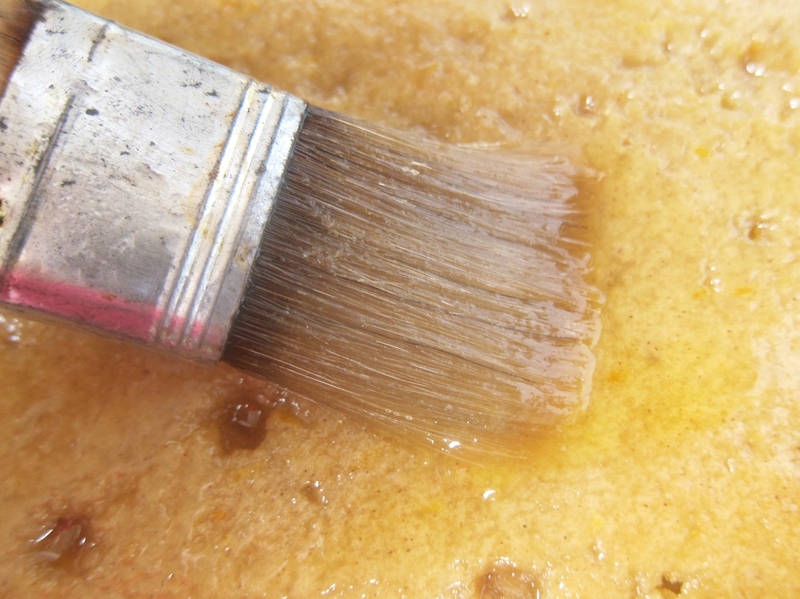 Use a pastry brush to generously paint the rum soak all over the cake. It might seem like too much sauce, but after three or four rounds of brushing and occasionally re-poking with the skewer, the sauce will be all used up and the cake will not get soggy. 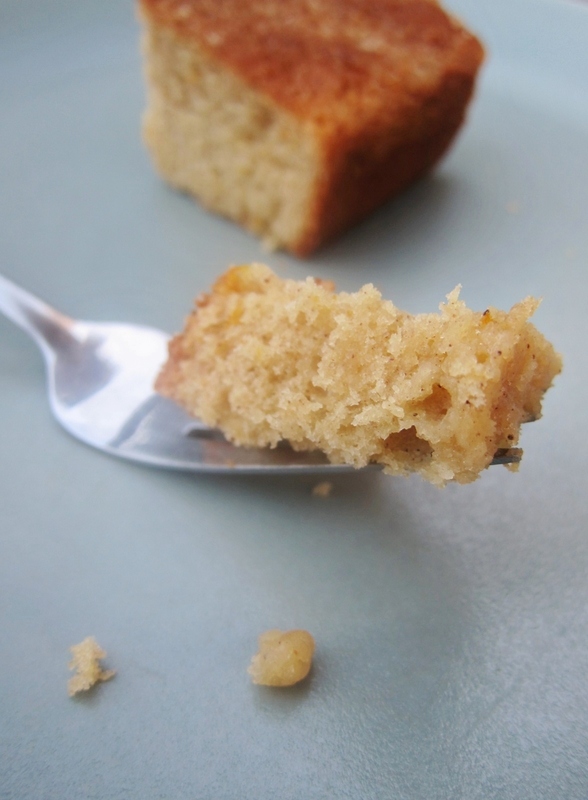 Let cake cool in pan at room temperature until no longer warm to the touch. When ready to serve, invert the cake onto a platter, cookie sheet, or large cutting board. Slice, serving in paper cupcake liners if desired. Store cake covered at room temperature; do not chill. 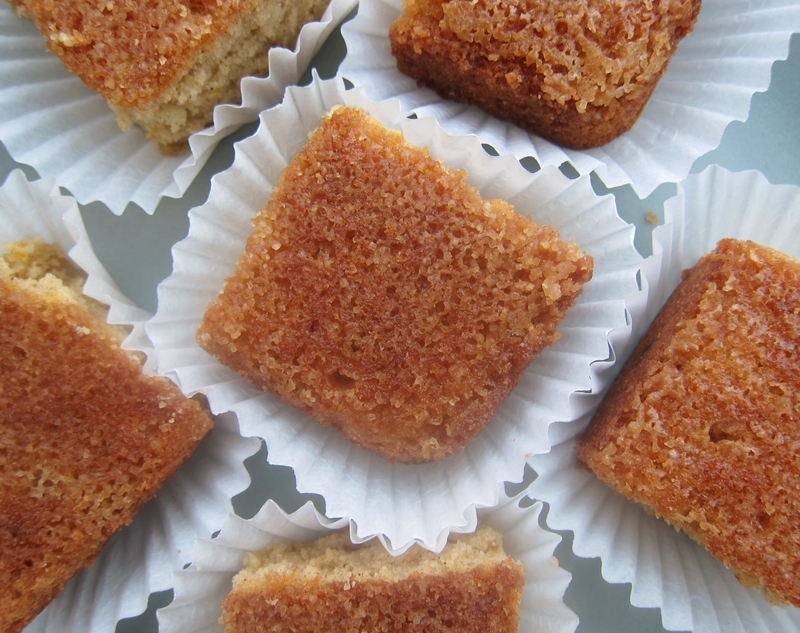 Crispy on the top and delightfully gooey on the bottom, buttered rum cake offers not only an incredible symphony of textures, but also a whisper of citrus and cinnamon spice. Its warm rum presence imparts a soft undertone of spirits that’s both calming and captivating, with just enough rum that some tasters won’t quite distinguish it, while others will relish in recognizing it. 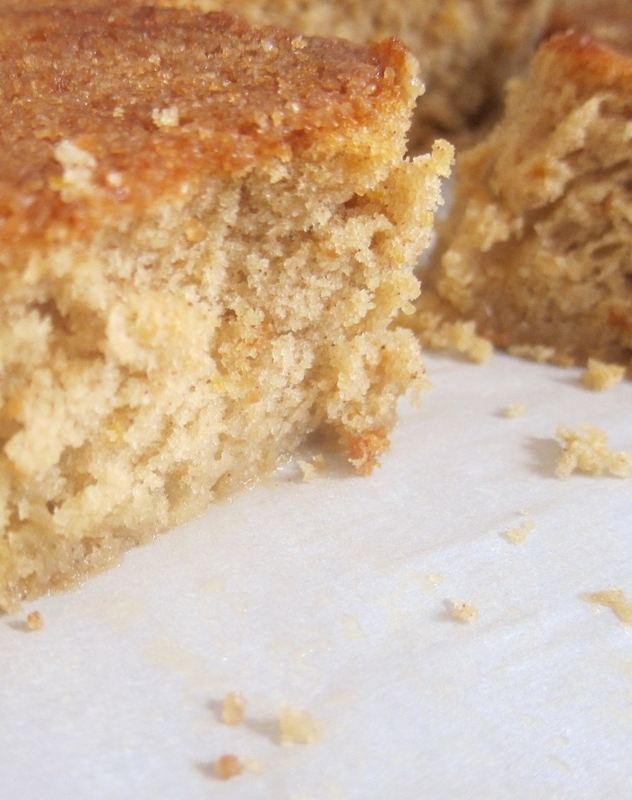 One part rich adult indulgence, one part casual coffee-cake-like treat, buttered rum cake is the best of many worlds in one. For me, it’s a delicious nod to the lovely and laid-back evening that inspired it. *Maybe next time… For this recipe (especially for the rum soak) I like to use good quality butter, if possible, salted and grass fed — though any kind will do. For a decadent and utterly delicious treat, warm the slices for a few seconds just before serving (highly recommended!). 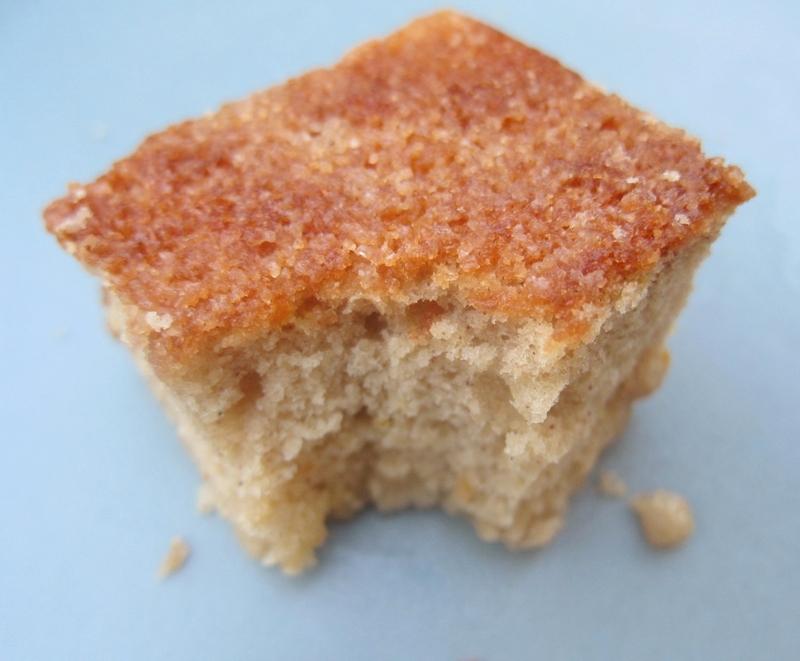 If you used a metal pan (not glass or ceramic), you can create a crispier, more caramelized sugar top if you’d like: place the baked cake (just rum soaked, still warm and in the pan) on top of a low-heated griddle for 5-10 minutes. This cake goes with almost anything: fresh berries, a scoop of ice cream, hot coffee, or even a cocktail. Be warmed by the casual spirit of every bite! This entry was posted in Baking with Booze, Cakes & Cupcakes, Sweets and tagged baking, baking with booze, booze, coffee cake, dessert, food, recipe, rum, rum dessert, spiced rum. Bookmark the permalink. Thank you! I know the feeling of being corrupted — ha! — and it definitely surfaces in my baking from time to time. Oh my, what a vivid description of your meal but also the hot buttered rum. Makes me want to run out for the ingredients right now. The top of that cake really grabs me. I have to ask you though – all of your cakes have such incredible texture. I’ve heard that overbeating isn’t good but is that the trick or is it the ingredients, timing, or just the baker? Thanks so much, Diane. I don’t think there’s one real secret to good texture (and it’s definitely not just the baker), but I do feel that the ingredients are the main thing. I’ve transformed cakes into springy loveliness by adding a pinch of baking soda after a dense rough draft version that only used baking powder, and I’ve made cakes much more moist by omitting an egg. (But of course neither of these actions work all the time, an they can throw off other qualities of the cake). I’ve also accidentally made rubbery cakes by using (much too much) yogurt, and have lots of other mishaps in my history. There are just so many variables leading to the outcome, but thankfully, the mistakes are edible! Oh my gosh! What have you done?! Now I need to make this…treadmill here I come. From your photos, I can see it will be truly worth it! Hahahaha…have a great day! Thank you so much! Luckily this cake almost has to be shared because of its size and richness, and that means less time on your treadmill, right? 🙂 Cheers! looks yummy…will surely try this !! Thank you for your kind words and for stopping by! Your blog is lovely!